If you were out living your IRL life on Saturday you probably wouldn’t have noticed that #InAWorldWithNoTwitter was trending on Twitter. And that’s ok, because now you know. The tweets were funny mixed with kinda depressing mixed with sad by true. 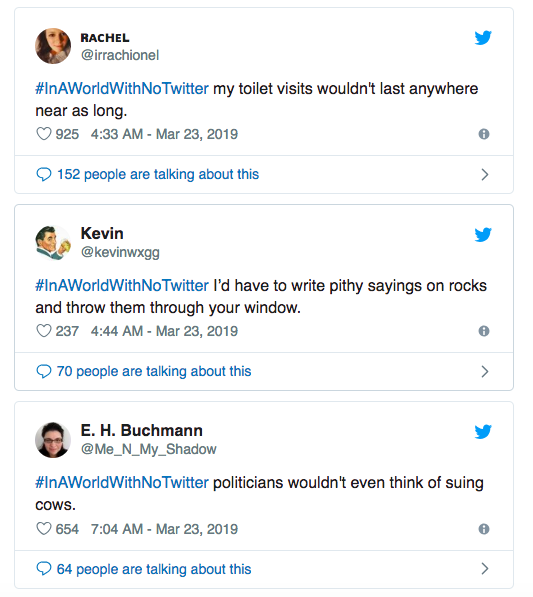 Apparently, #InAWorldWithNoTwitter people wouldn’t know what to be outraged about, they would use ‘there’, ‘their’, and ‘they’re’ incorrectly their whole lives without anyone correcting them, and their time in the restroom would be significantly shorter. But we must remember… in a world with no Twitter #InAWorldWithNoTwitter would never trend on Twitter… and that’d would be a bit of a loss, don’t you think? Instagram’s just-announced checkout feature lets online shoppers (that may not have even known they were online shoppers until the posts popped up) buy goods from brands without ever leaving Instagram. Still in its testing phase, select early adopters of the feature include Kylie Cosmetics, Nike, Adidas, Revolve, Zara and H&M. Product Manager for Instagram Shopping, Layla Amjadi says the ultimate vision is to have checkout be available to all the businesses on Instagram, fulfilling one of the biggest asks the platform has had since Instagram Shopping’s inception. Shopping and checkout features are not available in ads and can only appear in unpaid posts and Stories. Twitter recently confirmed it’s developing a feature that will allow users to subscribe to tweets of interest and receive notifications on the conversation without having to like or reply (mild creep vibes, but we’re here for it). In response to the user who stealthily spotted the not-yet-released feature, Twitter said it is part of the work to make its platform “more conversational.” There’s no telling when it will be rolled out, but with better conversations being at the top of Twitter’s current list of goals, it could be pretty soon. Step aside, reaction emojis – Facebook has rolled out a new feature to its Messenger platform that allows users to respond with text, GIF, video, emoji and photos to specific messages within a group chat. Sure, it’s not a groundbreaking addition to the platform, but it’s still a nice little feature that will make group chatting that much easier to follow. The feature has been released on both iOS and Android but if you can’t see it yet, don’t fret – Facebook often rolls out features like this in waves.